Merops corniculatus Latham, 1790, Endeavour River, Queensland, Australia. English: Leatherhead, four-o'clock; French: Polochion criard; German: Lärmlederkopf; Spanish: Filemon Griton. 13 in (33 cm); 3.4-4.4 oz (96-122 g). Bare black head and upright knob on bill. White throat, breast, and tail, with darker upperparts. Eastern Australia from coast to edge of plains and along Murray River. 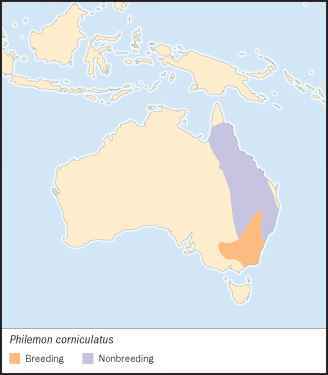 Trans-Fly region of New Guinea. 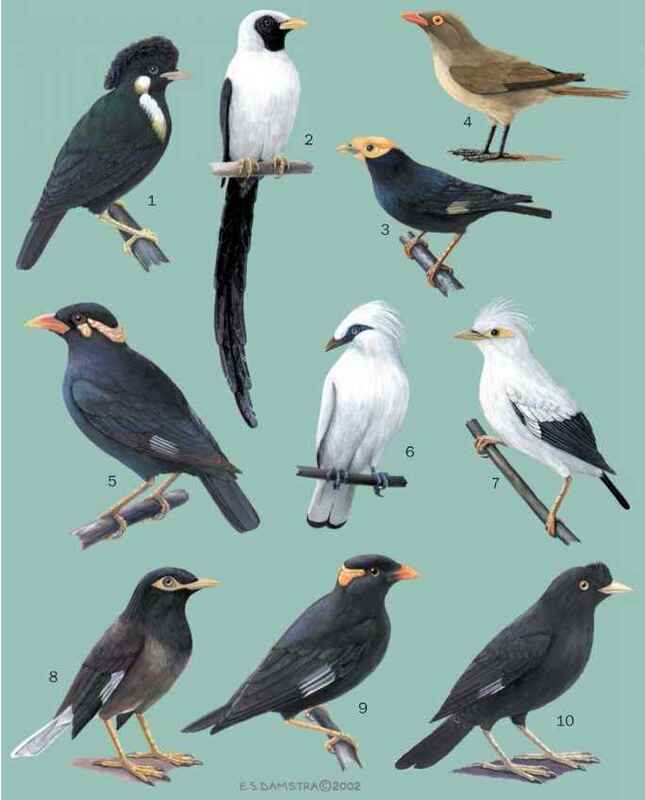 Separate subspecies in north Queensland and New Guinea. Woodlands and open forests, coastal heathland, farmland, parks and gardens. Can be noisy and quarrelsome at flowering trees, but also quiet and unobtrusive when breeding. Comical calls, like four o'clock, tobacco, chocka-lock, etc. by males. Calls become more complex when pairs chase around during breeding season. Pairs may duet. Also emit softer calls and harsh alarm calls. May strike predators, including humans, near nest. Nectar of eucalyptus, mistletoes, or other plants; sometimes eat native or cultivated fruit. Insects and spiders taken by gleaning from foliage or capturing in flight, including large scarab beetles and cicadas. Exceptionally take eggs, young birds, and fish. May breed from August to March, but season can be short in any locality. Nests are large and conspicuous and globular, made of bark, grass, and often wool and placed on outer branches of eucalyptus and other trees or in saplings. Probably only female builds nest and incubates. Usually lay three eggs (occasionally two or four), which hatch after about 16 days. Young fledge at 16-17 days.